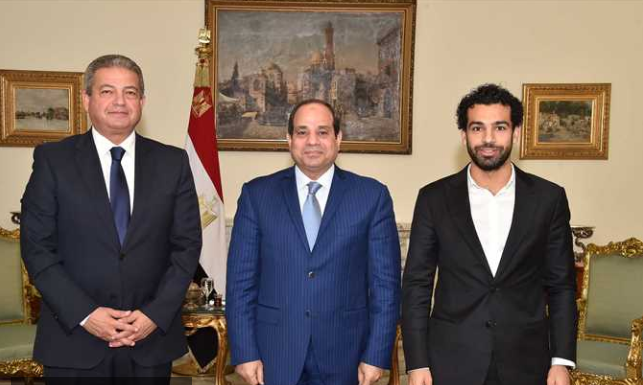 President Abdel Fattah al-Sisi congratulated on Tuesday Mohamed Salah, national football team player and Liverpool forward, for winning the 2017/2018 English Premier League Player of the Year award. “I congratulate the son of Egypt, Mohamed Salah, for his achievement which requires pride, and affirms the amazing capabilities of Egyptians in all fields. I’m proud of him and of every Egyptian who upholds the name of Egypt,” Sisi said on his Twitter page. “Congratulations to @LFC’s Mo Salah, crowned the Men’s PFA Players’ Player of the Year,” Professional Footballers’ Association (PFA) official Twitter page wrote. “Congratulations, Mo! @22mosalah has been named the @PFA Players’ Player of the Year,” Liverpool FC official Twitter page also wrote. Salah was crowned the 2017/18 Premier League Player of the Year by the PFA after his spectacular ongoing 41-goal debut season. In a remarkable feat, the Egyptian king snatched the celebrated award after fierce competition with Manchester City midfielder Kevin De Bruyne and Spurs forward Harry Kane, to become the first Egyptian player to win the award. Salah is the second African player to win the award, after Algerian and Leicester City star Riyad Mahrez, who won the award in the 2015-16 season. Salah also became the seventh Liverpool player to win the award in the club’s history. Earlier this month, Salah overtook former Chelsea striker Didier Drogba as the highest-scoring African player in a single Premier League season after scoring his 30th goal against Bournemouth.